Leptis Magna, also known as Lectis Magna or Lepcis Magna, (also Lpqy or Neapolis), located on North Africa's Mediterranean coast in what is now Libya, was originally a Phoenician colony, later part of the Carthaginian empire, the kingdom of Massinissa, and finally a prominent city of the Roman Empire. The ancient city's most famous son was the emperor Septimius Severus. Evidence suggests that Leptis was an important center of agricultural and commercial life. Originally founded by the Phoenicians in the tenth century B.C.E., it was settled by the Carthaginians, became a Punic city, and eventually one of the Roman Empire's most important cities. Leptis Magna weakened as Rome weakened. It fell under control of the Vandals, was ransacked by Berbers and was a target of the Arab conquest of 642. It was at this point that this once glorious city was abandoned and eventually forgotten. The history of Leptis Magna is the same history that befell much of the ancient world: that of one empire conquering another. Located two miles east of Al Khums, Libya, and 81 miles east of Tripoli the spectacular site contains some of the most complete and well-preserved ruins of the Roman Empire, and was designated a UNESCO World Heritage Site in 1982. The city is believed to have been founded by Phoenicians of Tyre or Sidon in approximately the tenth century B.C.E. 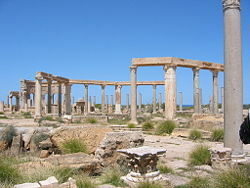 Carthaginians later settled in Leptis Magna around the end of the sixth century B.C.E. Within one hundred years it had become prominent as Carthage became a major power in the Mediterranean. Its harbor at the mouth of the Wadi Labdah placed it in a prime position as a Mediterranean and trans-Saharan trade center. The thriving agriculture in the fertile coastal region turned Leptis Magna into an important market center. It became a Punic city, passing to Masinissa's Numidian kingdom in 202 B.C.E. It eventually broke away and became an ally of Rome, becoming a part of the new Roman province of Africa around 23 B.C.E., although from about 200 B.C.E. onward it was for all intents and purposes an independent city. It retained a number of its Punic legal and cultural traditions, including its municipal constitution and the official use of the Punic language. It soon prospered and became one of the leading cities of Roman Africa and a major trading post. 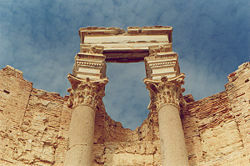 Leptis achieved its greatest prominence beginning in 193, when a native son, Lucius Septimius Severus, became emperor. He favored his hometown above all other provincial cities, and the buildings and wealth he lavished on it made Leptis Magna the third most-important city in Africa, rivaling Carthage and Alexandria. Under Severus' direction an ambitious building program was initiated, including the creation of a new forum and the rebuilding of the docks and harbor. Soon Leptis overextended itself and began to decline due in part to increasing insecurity of the frontiers. As a part of Roman Africa, it was affected by what became known as the Crisis of the Third Century—the crumbling and near collapse of the Roman Empire between 235 and 284. This was caused by three simultaneous crises: external invasion, internal civil war, and economic collapse. The changes in the institutions, society, economic life and eventually religion were so profound and fundamental, that the this period is increasingly seen as the watershed marking the difference between the classical world and the early medieval world, or world of late antiquity. With this instability in the Empire, Leptis Magna's importance also fell into a decline, and by the middle of the fourth century, large parts of the city had been abandoned and fell into ruin. The historian Ammianus Marcellinus recounts that the crisis was worsened by a corrupt Roman governor named Romanus during a major tribal raid who demanded bribes to protect the city. The ruined city could not pay these, and complained to the emperor Valentianian. Romanus then bribed people at court and arranged for the Leptan envoys to be punished 'for bringing false accusations'. It enjoyed a minor renaissance beginning in the reign of the emperor Theodosius I. 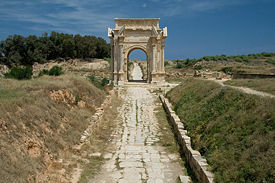 In 439, Leptis Magna and the rest of the cities of Tripolitania fell under the control of the Vandals when their king, Gaiseric, captured Carthage from the Romans and made it his capital. Unfortunately for the future of Leptis Magna, Gaiseric ordered the city's walls demolished so as to dissuade its people from rebelling against Vandal rule. But the people of Leptis and the Vandals both paid a heavy price for this in 523, when a group of Berber raiders sacked the city. Belisarius recaptured Leptis Magna in the name of Rome 10 years later, and in 534 he destroyed the kingdom of the Vandals. Leptis became a provincial capital of the Eastern Roman Empire, but never recovered from the destruction wreaked upon it by the Berbers. 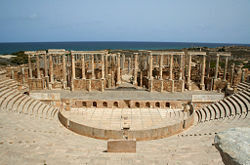 The massacre of all the Berber chiefs of the Levathes, ordered by Duke Sergius at Leptis Magna in 543, provoked a terrible insurrection, through which the Romans nearly lost Africa. By the time of the Arab conquest of Tripolitania in the 642, the city was abandoned except for a Byzantine garrison force. The ruins of Leptis Magna were pillaged throughout history, though for the most part, they lay buried by sand. Excavations began in the 1920s. At that time the Libyan Antiquities Service, as well as groups of Italian archaeologists, began laboring to preserve and study the site. 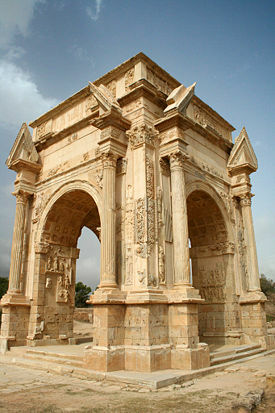 Arch of Roman emperor Lucius Septimius Severus (AD 146-211) in Leptis Magna. Image by Luca Galuzzi, 2007. 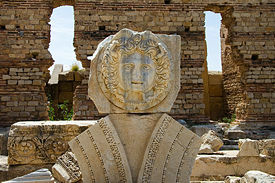 Gorgon head sculpture in Leptis Magna. Image by Luca Galuzzi, 2007. 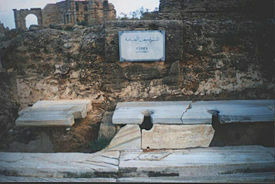 Ancient latrines in Leptis Magna. During World War II the Royal Air Force planned to erect a radar station on the site. British art historians and archaeologists John Ward-Perkins and Sir Robert Eric Mortimer Wheeler intervened. Their report was given to Sir Leonard Woolley, of the Monuments and Fine Arts branch in England which worked to protect monuments and sites throughout Europe and Asia, worked with them on plans for the preservation of all Libya's historic sites. In June 2005, it was revealed that a team from the University of Hamburg had been working along the coast of Libya when they uncovered a 30-foot-length of five colorful mosaics created during the first or second century. The mosaics show with exceptional clarity depictions of a warrior in combat with a deer, four young men wrestling a wild bull to the ground, and a gladiator resting in a state of fatigue, staring at his slain opponent. The mosaics decorated the walls of a cold plunge pool in a bath house within a Roman villa. The gladiator mosaic is noted by scholars as one of the finest examples of representational mosaic art ever seen—a "masterpiece comparable in quality with the Alexander mosaic in Pompeii." The mosaics were originally discovered in 2000, but were kept secret to avoid looting. They are currently on display in the Leptis Magna Museum. ↑ 1.0 1.1 1.2 Leptis Magna Encyclopædia Britannica Online. Retrieved June 28, 2018. ↑ Catholic Encyclopedia, Volume IX. 1910. Leptis Magna Retrieved June 28, 2018. ↑ Hafed Walda, Lepcis Magna, The Roman Empire in Africa Lepcis Magna Excavations. Retrieved June 28, 2018. ↑ Lepcis Magna Livius.Org. Retrieved June 28, 2018. ↑ More on Leptis Magna: During World War II, Friend of Lawrence of Arabia Prepared Preservation Plans for All of Libya's Ancient Sites ARCA (Association for Research into Crimes against Art). Retrieved June 28, 2018. ↑ Dalya Alberge, Roman Mosaic 'Worthy of Botticelli', The Times Online, June 13, 2005. Retrieved June 28, 2018. Ward-Perkins, J. B., and J. M. C. Toynbee. The hunting baths at Lepcis Magna. Oxford: Printed by C. Batey for the Society of Antiquaries of London, 1949. This page was last modified on 26 July 2018, at 16:26.